The approximately 1,172 mile Dakota Access Pipeline1 has been highly controversial since its public unveiling in 2014.2 The Standing Rock Sioux and allied organizations took ultimately unsuccessful legal action to stop construction of the project, 3 while youth from the reservation began a social media campaign which gradually morphed into a larger movement with dozens of associated hashtags.4 I performed network analysis on #NODAPL, the most prominent of these hashtags on Twitter, between October 22 – 30, 2016. This revealed some interesting trends in the data, including the key role of alternative media, celebrities, and seemingly random twitter users holding the network together. Another surprising finding was the relatively minor role that republican candidate Donald Trump’s twitter account plays in the #NODAPL conversation, especially compared to the accounts of Barack Obama, Hilary Clinton, Bernie Sanders, and Dr. Jill Stein. Due to restrictions from the Twitter API and crashes / limitations from the software (see below), I do not have complete access to all Tweet traffic involving #NODAPL.5 I used the Twitter Archiving Google Sheet (TAGS) 6.16 to capture tweets that featured #NODAPL somewhere the tweet text. 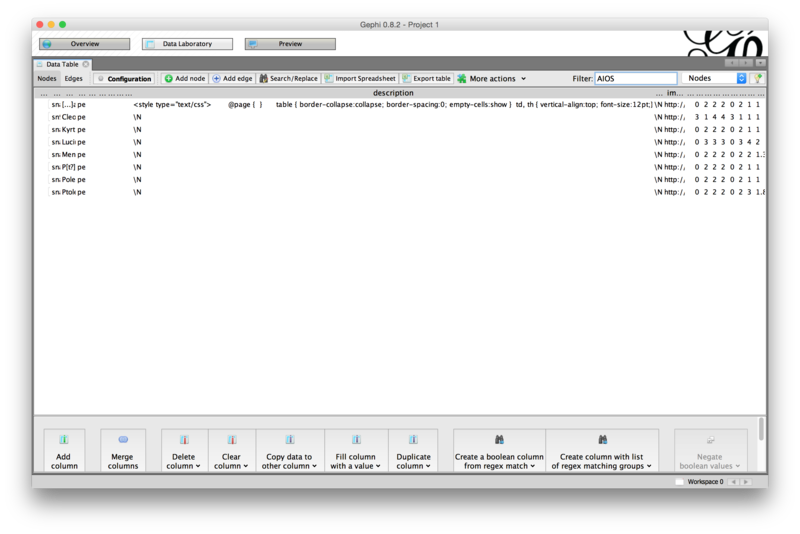 The resulting sheets were then imported into a database, then exported into an edges table for use in Gephi. For technical details, see the “Detailed Procedure” section below. # NODAPL itself was excluded as a node in this analysis, as every tweet and user would be directly connected to it. This network features 133,702 nodes linked by 630,393 edges.7 I used Gephi to identify communities of nodes that are strongly linked together, which are represented by different colors in the network visualization.8 In addition, I ran some basic network statistics, including measuring the degree of nodes (the number of edges between two individuals, hashtags, or individuals and hashtags) on the graph. In these measurements out-degree indicates that a node initiates a link to another node in the graph, which in this case means another user name or hashtag was mentioned in a text by the node in question. 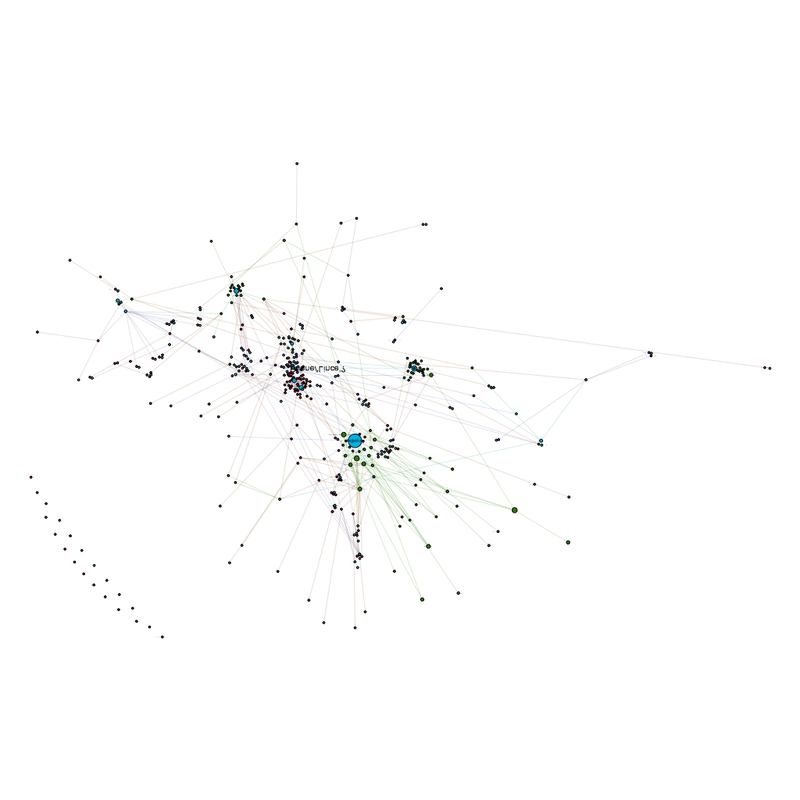 in-degree measures incoming edges, which indicates that a particular node is the subject of a twitter conversation. I first looked at the in-degree measurement. #STANDINGROCK was by far the node with the highest in-degree, indicating its popularity as a potential alternative hashtag to #NODAPL. @POTUS, the official twitter account of the President of the United States, was in second place, followed by #WATERISLIFE, @HILLARYCLINTON, @OFFICIALJADEN, @UR_NINJA, @SHAILENEWOODLEY, @MARKRUFFALO, and @RUTHHHOPKINS. In this list, only two nodes are not politicians, hashtags, or celebrities. @UR_Ninja is the official twitter account of Unicorn Riot9, a 501(c)3 nonprofit organization based in Minneapolis, Minnesota10 which has done extensive reporting on the Dakota Access Pipeline protests. @RUTHHHOPKINS is the twitter account of Ruth Hopkins, a Dakota/Lakota Sioux writer, journalist, and blogger. The high degree count on these nodes indicates that they may function as an information service, where their reporting on the situation is retweeted and mentioned by many other nodes in the network. This measurement also revealed a marked difference between the in-degree and out-degree of nodes. The top 34 nodes by number of degrees are so dominated by in-degree connections that no node has an out-degree that contains more than 3.17% of its total edges. This reveals that such nodes are being “talked at”: they are mentioned in tweets, retweeted in large numbers, but by and large feature extremely limited further engagement with other Twitter users. Another account of a politician, Dr. Jill Stein (@DRJILLSTEIN), is twelfth on in-degree, but only has five outwardly directed edges. Despite active involvement at the protests leading to charges of criminal trespass and criminal mischief,13 Dr. Stein’s twitter account has barely engaged with other users, with the only mentions in this data set originating from a retweet that mentioned Hillary Clinton and Barack Obama.14 Interestingly, despite over 1,000 retweets (many of which were collected by this study), her tweet mentioning both Hillary Clinton and Donald Trump15 was not captured by the TAGS software. Drilling down further into the data, I next looked at the nodes with the highest out-degree, which represents nodes who mentioned other users and hashtags. There were some interesting variations from the trends of in-degree nodes. Three users, @DEANLEH, @CANATIVEOBT, and @WMN4SRVL had in-degree and out-degree measurements that were no more than 20% divergent from each other. 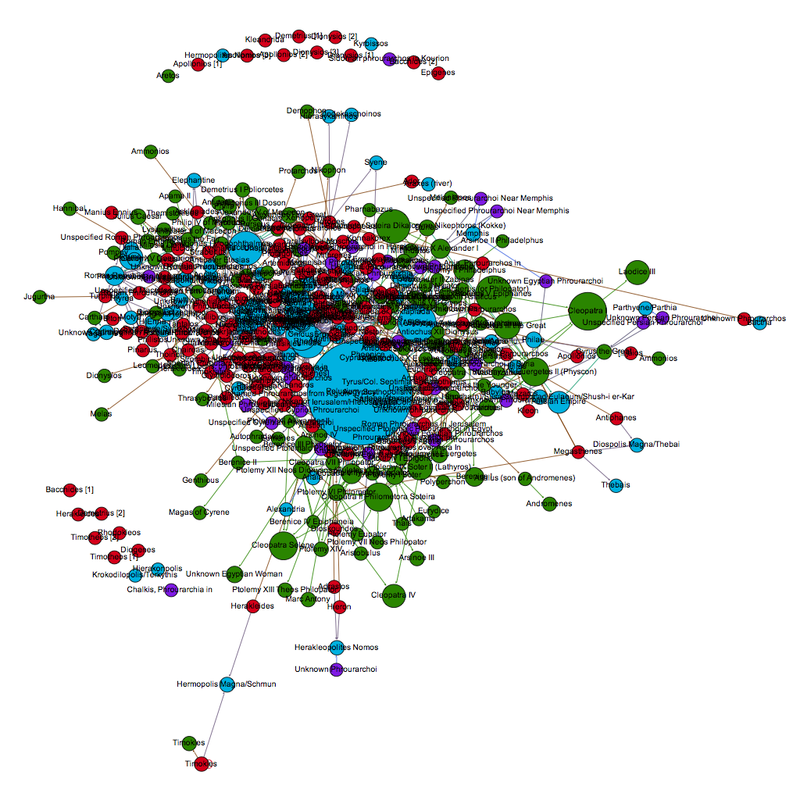 However, this does not mean that these nodes are engaged in extensive online conversations. These accounts all feature extensive retweets and linkages to different causes often associated with the progressive movement, including climate change awareness, opposition to institutional racism, feminism, and anti-corporatism. All three of these accounts seem to perform a function similar to news aggregation, as the majority of their mentions are retweets from other sources and are not extensive discussions with other users. Another useful statistics, betweenness, measures the number of shortest paths (connections between any two nodes on the graph that may involve any number of additional nodes) that pass through a specific node.19 Nodes with a high betweenness are “central” in that they play a critical role in connecting (and therefore moving information) through the network. The single node with the highest betweenness is @UR_NINJA, which combined with its high degree ranking, suggests that the news service plays a critical role in bringing together individuals on the graph who are interested in social justice / progressive issues. 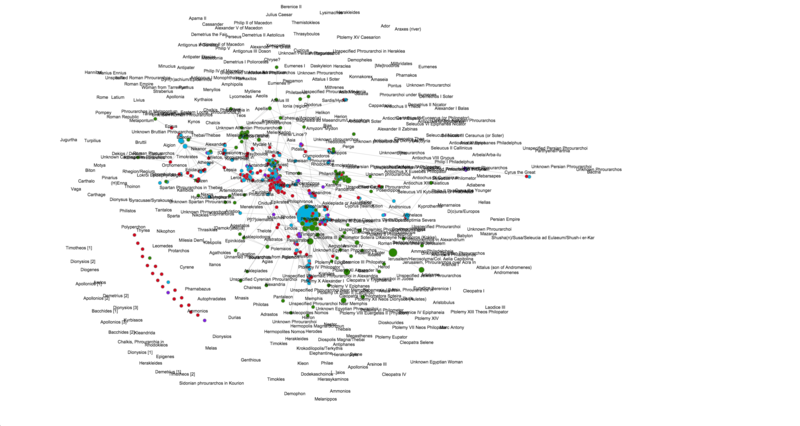 Four other nodes in the top 25 betweenness list are likewise in the top 25 nodes by degree. The remaing nodes are somewhat surprising. The twitter profile for second highest betweenness node, @TNPMR has a limited online footprint outside of Twitter, and does not seem to be involved in a leadership capacity in a social movement or media organization. Another important node in this measurement, @AMAZONMILLER, only scores 1638th in total degrees, yet still retains an important place in the network structure. Looking further at this data, I next examined at each individual user’s Twitter profile who scored in the top 25 for betweenness. I divided this list into people who seem to be primarily interested in progressive causes in general vs. those who expressed affinity for indigenous rights issues. The results were nearly evenly split, with a slight edge to the more general progressivists. However, only two of top ten nodes in the betweenness category focused primarily on indigenous issues, while the rest were concerned with progressivist issues more broadly. What this may indicate is that, as a whole, indigenous activists may face future difficulties in promoting their narrative outside of the more general progressive interests of the online community. These preliminary steps have also revealed some issues about data collection and curation. Twitter’s REST and streaming APIs are woefully inadequate for examining the whole data set. While Twitter provides, in theory, a representative sample of the data set, one of the powers of social network analysis is the discovery of weak ties and other network structures which are by definition not representative of the network as a whole. This can be frustrating for academic study of the network, and extremely detrimental to movements that depend on social media to transmit their messages. Groups can look at their own twitter histories, but the larger network structure, along with crucial weak ties, may be invisible to them. Although Twitter does provide mechanisms for obtaining the entire history of hashtag usage, the organic development of other hashtags which are not heavily watched from the beginning is almost certainly a cost-prohibitive proposition for social movements that are loosely organized, under-funded, and / or have limited computer infrastructure. It would be a significant benefit for such groups to gain access to the Twitter history of their movements, and be able to the evolution of the conversation on social media. As hashtag use can grow organically, with many different signifiers used for conversations, Twitter’s current pricing structure and data access model puts these groups at a severe disadvantage and hinders the identification and cultivation of allied communities and supporters. A less pressing, but nevertheless important, issue is access to Twitter’s archive by researchers. Unlike print material or traditional media, which may be tedious to analyze but are fully (and for the most part cheaply) accessible to interested parties, the complete set of tweets on a topic are impossible to study without significant funding. Even if a researcher could guess all of the hashtags that could emerge from a dynamic topic, the Twitter streaming API does not provide all relevant tweets. Such limitations make it challenging to use Twitter data in a pedagogical setting. Some of my students have expressed interest in conducting similar projects, but the need for constant downstream connections and the high cost of historical tweets have made all but the most superficial studies impossible. There needs to be a more cost-effective means for projects operating on a limited budget, students, and other academic uses of Twitter’s data. In addition to the data set on #NoDAPL featured here, I have also compiled a number of hashtags and data in separate TAGS sheets which can be combined to see more of the network. I am currently running a python script to grab more tweet data from the streaming API, which should provide more tweets. After placing this data in the network and performing some basic sentiment analysis, I want to see if distinct communities have formed around different hashtags, and if those communities have noticeably different rhetorical strategies that correspond to the inclusion of certain hashtags. A long term goal is to secure funding to obtain the complete twitter archive of #NODAPL and related hashtags in order to perform a full social network and sentiment analysis. In addition, I would like to examine the twitter history of @UR_Ninja and other alternative news organizations to see if their followers form recognizable activist communities. As part of this analysis, I am especially interested to see how these communities change when news organization shifts their focus between causes (like #FERGUSON to #NODAPL), and to examine the interactions of these virtual communities with different social movements. To overcome the issues I discovered with TAGS and TwitterStreamingImporter, I am currently running a python script (modeled after http://adilmoujahid.com/posts/2014/07/twitter-analytics/) that pulls in the full json object from Twitter’s streaming API for a number of hashtags related to #NODAPL. I think the best approach is to perform a weekly update of a “master” network that captures all of the data that I can dealing with #NODAPL, and then running statistics / etc from a filtered network in Gephi. I will be sure to post any additional developments here. The first difficulty in analyzing Twitter traffic is actually obtaining Twitter data. While Twitter does retain a historical archive of all tweets, this resource is currently inaccessible for academic research unless licensing fees are paid to an archival service such as GNIP. There is an indication that GNIP is aware of the power of Twitter analytics for academic research, and there are different pricing plans available,20 but as my project is currently in the exploratory phase, I am operating without any funding. As such, I needed an alternative. I first used TAGS to pull historical and incoming tweets into separate google sheets for each hashtag I was interested in. TAGS uses Twitter’s REST API, which limits search rates and results.21 I ran into rate limits rather quickly with my searches; in addition, my documents in google also hit their size and row limit. TAGS does not provide the entire result from the Twitter API: fields like place, retweeted (which indicates if a tweet was retweeted or not), and other useful fields are left off. Finally, I noticed that the text of tweets was often truncated; this made searching form complete user names, hashtags, and full text problematic. Although TAGS is a convent way to collect tweets, it can not possibly hope to represent the full network. Despite these imitations, TAGS can still provide some powerful insights with a little modification. After importing my TAGS documents into a postgresql database, I mined the tweet text for all user mentions and hashtags from individual twitter users, which formed the edges of my network. 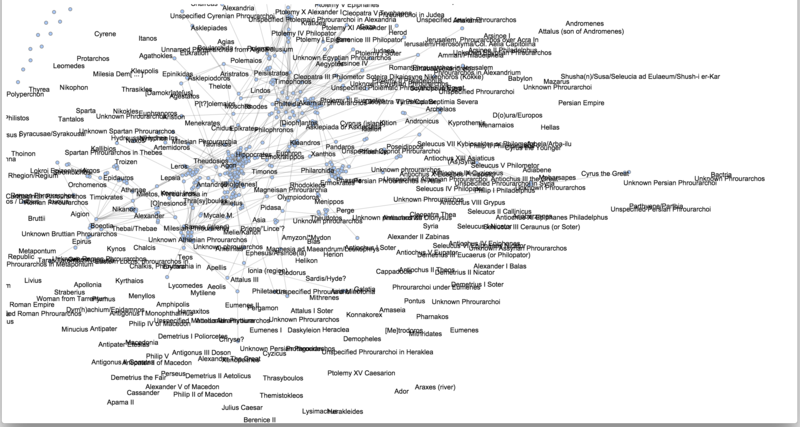 I then imported this into Gephi v.0.9.122, where I performed some basic network analysis and visualizations of the data. Unlike TAGS, TwitterStreamingImporter requires a constant internet connection to compile tweets. This is impracticable if not impossible for individuals who use a single laptop or other machine between different locations. I also experienced some crashes while performing analytics and changing/ running the visualization layouts; anyone wishing to style twitter data using this technique may wish to save constantly and export different files for styling purposes. This plugin does a nice job of drawing edges between users, tweets, and hashtags, and specifies the type of edge (tweet, retweet, hashtag, etc), although I would still like some more detailed information. The code is freely accessible,27 so I may be able to fork the repository and create a new plugin that pulls in all the data that I am interested in (especially geolocations, time of the tweet, etc). However, I think simply using a python script on a persistent connection will be my next step in this analysis. 1 LLC Dakota Access and United States Army Corps of Engineers, “Environmental Assessment: Dakota Access Pipeline Project, Crossings of Flowage Easements and Federal Lands” (U.S. Army Corps of Engineers, Omaha District, 2016), 8, http://purl.fdlp.gov/GPO/gpo74064. 2 Further reading can be found at https://nycstandswithstandingrock.wordpress.com/standingrocksyllabus/, created by NYC Stands for Standing Rock committee, a self described group “…group of Indigenous scholars and activists, and settler/ POC supporters.” (https://nycstandswithstandingrock.wordpress.com/about/). 3 A. B. C. News, “Court Denies Tribe’s Appeal to Block Dakota Access Pipeline,” ABC News, October 11, 2016, http://abcnews.go.com/US/court-denies-tribes-appeal-block-controversial-dakota-access/story?id=42700614. 4 “Rezpect Our Water,” accessed November 6, 2016, http://rezpectourwater.com/; “Thousands Nationwide Show Solidarity with the Standing Rock Sioux and #NoDAPL,” Sierra Club, September 13, 2016, http://www.sierraclub.org/planet/2016/09/thousands-nationwide-show-solidarity-standing-rock-sioux-and-nodapl. 5 n.b. Twitter is case insensitive, but all user names and hashtags are capitalized here. 7 I used Gephi with the OpenOrd Layout to create the network visualization1 after modifying TAGS data in a postgresql database. 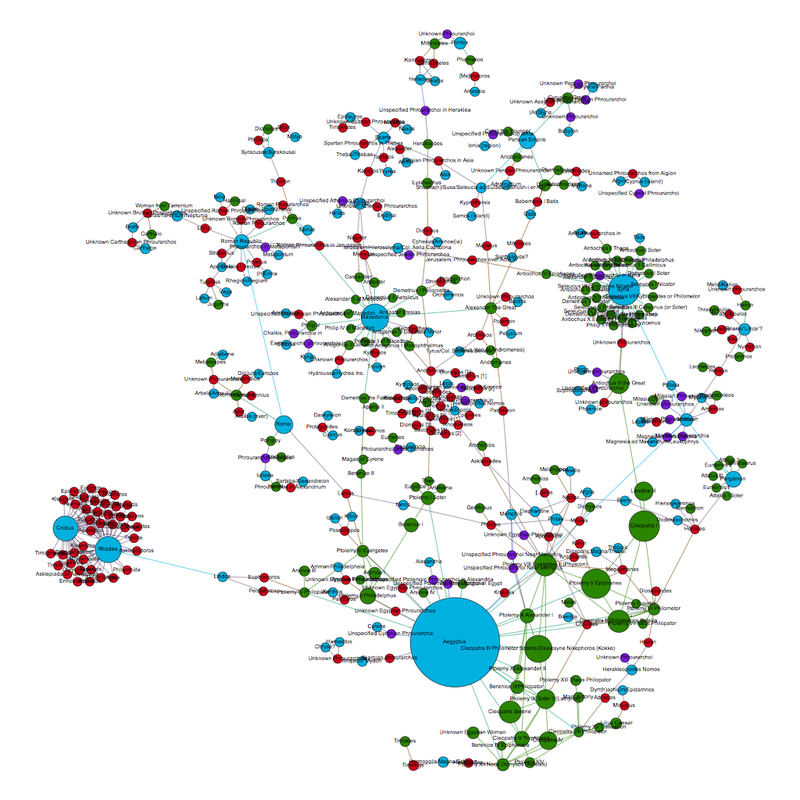 Although the OpenOrd layout is intended for undirected graphs (see https://marketplace.gephi.org/plugin/openord-layout/), its ability to handle large datasets and limited computing resources made it an attractive choice for this investigation. 8 The modularity for the graph is 0.414, with 862 communities detected. 32 of these communities had 100 or more nodes, and totaled 131,080 of the 133,702 total, which is 98.04% of the total. 10 “About,” Unicorn Riot, accessed October 30, 2016, http://www.unicornriot.ninja/?page_id=372. 11 The Root Staff, “#NoDAPL: Indigenous Youths Occupy Hillary Clinton’s Brooklyn, NY, Headquarters,” The Root, October 29, 2016, http://www.theroot.com/articles/news/2016/10/nodapl-indigenous-youth-occupy-hillary-clintons-brooklyn-headquarters/; “Indigenous Youth Occupy Hillary Clinton Campaign Headquarters to Demand She Take Stand on #DAPL,” Democracy Now!, accessed November 4, 2016, http://www.democracynow.org/2016/10/28/indigenous_youth_occupy_hillary_clinton_campaign. 16 Oliver Milman, “Dakota Access Pipeline Company and Donald Trump Have Close Financial Ties,” The Guardian, October 26, 2016, sec. US news, https://www.theguardian.com/us-news/2016/oct/26/donald-trump-dakota-access-pipeline-investment-energy-transfer-partners; “The Latest: Trump Holds Dakota Access Pipeline Company Stock,” US News & World Report, accessed November 4, 2016, http://www.usnews.com/news/us/articles/2016-10-26/the-latest-pipeline-protesters-think-their-removal-imminent. 17 “Did Trump Say Climate Change Was a Chinese Hoax?,” @politifact, accessed November 4, 2016, http://www.politifact.com/truth-o-meter/statements/2016/jun/03/hillary-clinton/yes-donald-trump-did-call-climate-change-chinese-h/. 19 I performed Eigenvector analysis on the data set, but there was little deviation in the top ranked nodes from ranking by total degree. 25 Jim Edwards, “Leaked Twitter API Data Shows the Number of Tweets Is in Serious Decline,” Business Insider, accessed November 2, 2016, http://www.businessinsider.com/tweets-on-twitter-is-in-serious-decline-2016-2; “Twitter Usage Statistics – Internet Live Stats,” accessed November 2, 2016, http://www.internetlivestats.com/twitter-statistics/#sources. 26 Research on the representative accuracy of Twitter’s API has been mixed; see Fred Morstatter et al., “Is the Sample Good Enough? Comparing Data from Twitter’s Streaming API with Twitter’s Firehose,” arXiv Preprint arXiv:1306.5204, 2013; Fred Morstatter, Jürgen Pfeffer, and Huan Liu, “When Is It Biased? : Assessing the Representativeness of Twitter’s Streaming API,” in Proceedings of the 23rd International Conference on World Wide Web (New York, NY: ACM, 2014). “A Pipeline Fight and America’s Dark Past.” The New Yorker, September 6, 2016. http://www.newyorker.com/news/daily-comment/a-pipeline-fight-and-americas-dark-past. “About.” NYC Stands with Standing Rock, September 13, 2016. https://nycstandswithstandingrock.wordpress.com/about/. “About.” Unicorn Riot. Accessed October 30, 2016. http://www.unicornriot.ninja/?page_id=372. “Appeals Court Halts Dakota Access Pipeline Work Pending Hearing.” Indianz. Accessed November 6, 2016. http://www.indianz.com/News/2016/09/16/appeals-court-halts-dakota-access-pipeli.asp. CNN, Marlena Baldacci, Emanuella Grinberg and Holly Yan. “Dakota Access Pipeline: Police Remove Protesters.” CNN. Accessed November 6, 2016. http://www.cnn.com/2016/10/27/us/dakota-access-pipeline-protests/index.html. Dakota Access, LLC, and United States Army Corps of Engineers. “Environmental Assessment: Dakota Access Pipeline Project, Crossings of Flowage Easements and Federal Lands.” U.S. Army Corps of Engineers, Omaha District, 2016. http://purl.fdlp.gov/GPO/gpo74064. “Dakota Access Pipeline.” Accessed November 6, 2016. http://www.daplpipelinefacts.com/. “Dakota Access Pipeline: Overview.” Accessed November 6, 2016. http://www.daplpipelinefacts.com/about/overview.html. “Did Trump Say Climate Change Was a Chinese Hoax?” @politifact. Accessed November 4, 2016. http://www.politifact.com/truth-o-meter/statements/2016/jun/03/hillary-clinton/yes-donald-trump-did-call-climate-change-chinese-h/. Edwards, Jim. “Leaked Twitter API Data Shows the Number of Tweets Is in Serious Decline.” Business Insider. Accessed November 2, 2016. http://www.businessinsider.com/tweets-on-twitter-is-in-serious-decline-2016-2. Healy, Jack. “From 280 Tribes, a Protest on the Plains.” The New York Times, September 11, 2016. http://www.nytimes.com/interactive/2016/09/12/us/12tribes.html. “Indigenous Youth Occupy Hillary Clinton Campaign Headquarters to Demand She Take Stand on #DAPL.” Democracy Now! Accessed November 4, 2016. http://www.democracynow.org/2016/10/28/indigenous_youth_occupy_hillary_clinton_campaign. “Judge Rules That Construction Can Proceed On Dakota Access Pipeline.” NPR.org. Accessed November 6, 2016. http://www.npr.org/sections/thetwo-way/2016/09/09/493280504/judge-rules-that-construction-can-proceed-on-dakota-access-pipeline. “Life in the Native American Oil Protest Camps.” BBC News, September 2, 2016, sec. US & Canada. http://www.bbc.com/news/world-us-canada-37249617. McCausland, Phil. “More Than 80 Dakota Pipeline Protesters Arrested, Some Pepper Sprayed.” NBC News, October 23, 2016. http://www.nbcnews.com/news/us-news/more-80-dakota-access-pipeline-protesters-arrested-some-pepper-sprayed-n671281. McCleary, Mike. “As Standing Rock Protesters Face Down Armored Trucks, the World Watches on Facebook.” WIRED. Accessed October 30, 2016. https://www.wired.com/2016/10/standing-rock-protesters-face-police-world-watches-facebook/. Milman, Oliver. “Dakota Access Pipeline Company and Donald Trump Have Close Financial Ties.” The Guardian, October 26, 2016, sec. US news. https://www.theguardian.com/us-news/2016/oct/26/donald-trump-dakota-access-pipeline-investment-energy-transfer-partners. Morstatter, Fred, Jürgen Pfeffer, and Huan Liu. “When Is It Biased? : Assessing the Representativeness of Twitter’s Streaming API.” In Proceedings of the 23rd International Conference on World Wide Web. New York, NY: ACM, 2014. Morstatter, Fred, Jürgen Pfeffer, Huan Liu, and Kathleen M Carley. “Is the Sample Good Enough? Comparing Data from Twitter’s Streaming API with Twitter’s Firehose.” arXiv Preprint arXiv:1306.5204, 2013. News, A. B. C. “Court Denies Tribe’s Appeal to Block Dakota Access Pipeline.” ABC News, October 11, 2016. http://abcnews.go.com/US/court-denies-tribes-appeal-block-controversial-dakota-access/story?id=42700614. ———. “Timeline of the Dakota Access Pipeline Protests.” ABC News, October 31, 2016. http://abcnews.go.com/US/timeline-dakota-access-pipeline-protests/story?id=43131355. “Rezpect Our Water.” Accessed November 6, 2016. http://rezpectourwater.com/. Staff, The Root. “#NoDAPL: Indigenous Youths Occupy Hillary Clinton’s Brooklyn, NY, Headquarters.” The Root, October 29, 2016. http://www.theroot.com/articles/news/2016/10/nodapl-indigenous-youth-occupy-hillary-clintons-brooklyn-headquarters/. “The Digital Transition: How the Presidential Transition Works in the Social Media Age.” Whitehouse.gov, October 31, 2016. https://www.whitehouse.gov/blog/2016/10/31/digital-transition-how-presidential-transition-works-social-media-age. “The Latest: Trump Holds Dakota Access Pipeline Company Stock.” US News & World Report. Accessed November 4, 2016. http://www.usnews.com/news/us/articles/2016-10-26/the-latest-pipeline-protesters-think-their-removal-imminent. “Thousands Nationwide Show Solidarity with the Standing Rock Sioux and #NoDAPL.” Sierra Club, September 13, 2016. http://www.sierraclub.org/planet/2016/09/thousands-nationwide-show-solidarity-standing-rock-sioux-and-nodapl. “Twitter Usage Statistics – Internet Live Stats.” Accessed November 2, 2016. http://www.internetlivestats.com/twitter-statistics/#sources. Williams, Weston. “Standing Rock Protests Escalate, as Tribe Calls for DOJ to Investigate.” Christian Science Monitor, October 24, 2016. http://www.csmonitor.com/USA/Justice/2016/1024/Standing-Rock-protests-escalate-as-tribe-calls-for-DOJ-to-investigate. 2 of N: Gephi, D3.js, and maps: Success! A working, geographically accurate map using Gephi, D3.js, and Leaflet. NOTE: Link subject to change. 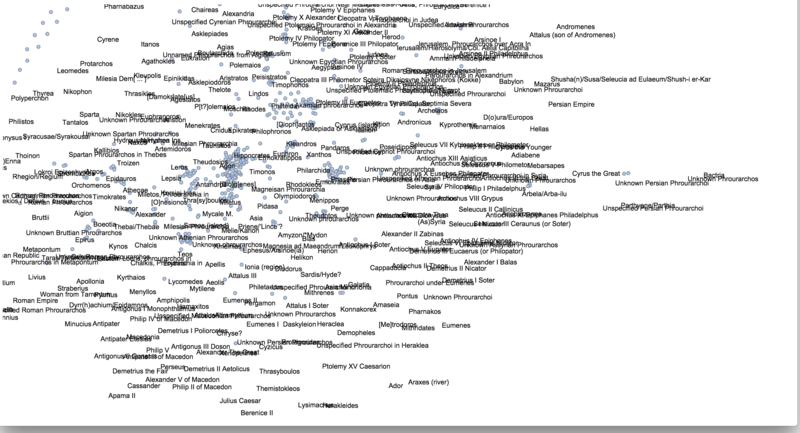 In my previous post I outlined how I used D3.js to display a “raw” JSON output from Gephi. After some hacking around, I am now able to display my Gephi data on an interactive leaflet map! Not all of my data has geographic information – indeed in many cases a specific longitude / latitude combination is inappropriate and would lend a false sense of permanence to anyone looking at the map. In my case I have names of Greek garrison commanders which have some relation to a place, but it is unclear in some instances if they are actually at a specific place, have dominion over the location, or are mentioned in an inscription for some other reason. Therefore, I need to locate data that has a fuzzy relation to a location (ancient people who may originate, reside, work, and be mentioned in different and / or unknown locations) and locations that may themselves have fuzzy or unknown geography. This is a problem for just about every ancient to pre-modern project, as we do not have a wealth of location information, or even a clear idea of where some people are at any particular moment. I want to show how social networks form around specific geographic points which are known, and have those social networks remain “reactive” on zooms, changing map states, etc. This can be expanded to encompass epistolary networks, knowledge maps, etc – basically anything that links people together who may not be locatable themselves. Gephi does not output in GeoJSON, and the remaining export options that are geographically oriented require that *all* nodes have geographic information. As this is not my case (see above), the standard export options will not work for me. Also, as part of my work on BAM, I want to create a framework that is as “plug and play” as possible, so that we can simply take Gephi files and drop them into the system to make new modules. Therefore this work has to be reproducible with a minimum of tweaking. So, let us get to the code! Next, we need to put in “dummy” coordinates for locations that do not have geography. This is messy and could probably be removed with some more efficient coding later. For the nodes that do have geography, the map.latLngToLayerPoint will translate the values into map units, which places them where they need to go. These are simply lat lon attributes in the Gephi file. I also set nodes that are fixed / not fixed, based on the presence of lat/lon data. Now to setup the nodes. I wanted to do a popup on a mouseclick event, but for some reason this is not firing (mousedown and mouseover do work, however). The following code builds the nodes, with radii, fill, and other information pulled from the JSON file. It also toggles a div that is populated with attribute information from the JSON. There is still some work to do at this part: the .css needs to be cleaned up, images need to be resized, and the attribute information for the nodes should be a configurable option when importing the JSON. //for some reason the click event is not registering, but mousedown and mouseover are. Now for the transformations when the map state changes. The idea is to keep the fixed nodes in the correct place, but to redraw the “floating” nodes when the map is zoomed in and out. The nodes that need to be transformed are dealt with first, then the links are rebuilt with the new (or fixed) x / y data. The click even not working. This is a real puzzler. Tweaking the distances of the simulation – I do not want nodes to be placed half a world away from their connections. This may have to be map zoom level dependent. Style the links according to Gephi and provide popups where applicable. This should be easy enough to do, but simply hasn’t been done in this code. Tweak the visibility of the connections and nodes. While retaining an option to show the entire network at once, my idea is to have a map that starts out with JUST the locations, and then makes the nodes that are connected to that location visible when you click on it (which would also apply to the unlocated nodes – i.e. you see what they are connected to when you click on them). Connected to the above point, the implementation of a slider to show nodes in a particular timeframe. As my data spans a period from the 600s BCE to the 200s CE, this would provide a better snapshot of a particular network at a particular time. Implement a URI based system – you will be able to go to address/someEntityName and that entity will be selected with its information pane and connected neighbors displayed. This will result in an RDF file that will be sent to the Pelagios Project. 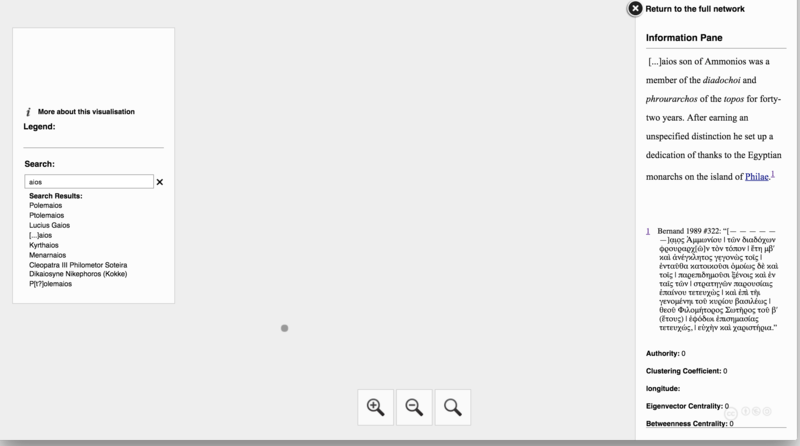 Fix up the .css for the information pane. I will detail further steps in a later post. Update (11/12/15): See this post to integrate the following code with leaflet. 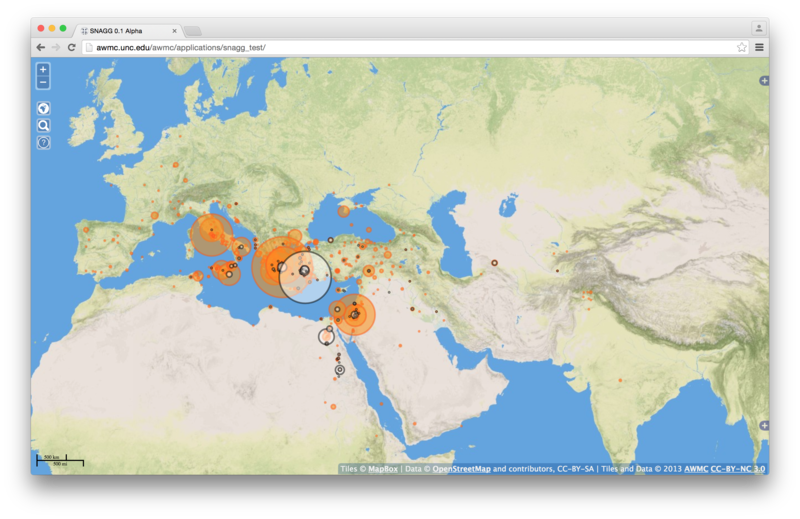 After finding no real way to use background maps with SigmaJs, I stumbled on this example of combining leaflet with D3.js: http://bost.ocks.org/mike/leaflet/. The example is more closely aligned with what I want to achieve, which is using a display library to show a social network that respects / interacts with underlying geography. This would be a very valuable visualization for both TBib/BAM and my own work on garrisons, and completing it will allow me to get back to other tasks, like pounding out Greek inscriptions. For this work I am not tied to Gephi, but I do like its interface and low learning curve, which is valuable for pedagogical and collaborative use. 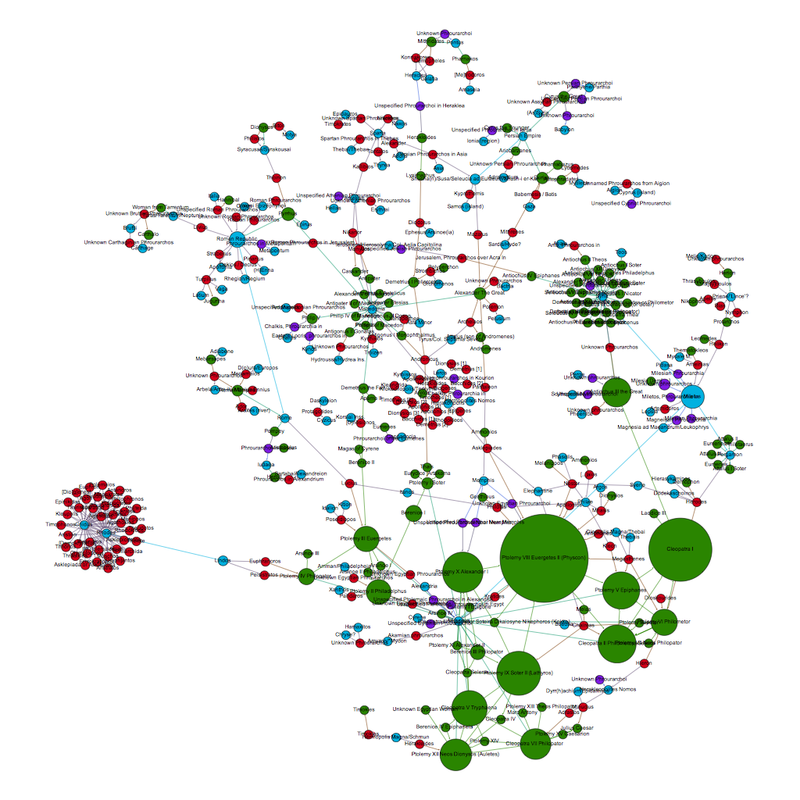 So, my first order of business is getting a Gephi project to talk nicely with D3.js. There is, of course, a nice example already in the wild: http://bl.ocks.org/susielu/9526340. However, this presented some serious problems, which I will outline to (hopefully!) help others who may be going down this path. So, refer back to http://bl.ocks.org/susielu/9526340 for the code template – what follows below are additions / modifications. For this project, I want to recreate the image to the right, which was created in Gephi. If you read my previous post on this topic, this image uses a geo-layout plugin to place locations from Pleiades in their correct geographic placement, then uses other layouts to place the people and other non locatable nodes. The eventual goal is to make an interactive network map above an interactive geographic map, so simply exporting these out as a flat svg file will not provide the functionality I need. My first attempt to simply plug in my own data met with disaster. First, I got hit with an “Uncaught TypeError: Cannot read property ‘weight’ of undefined” error and absolutely no graph. Looking into it, I noticed that the example assumed that nodes would be referenced by their position in an index, NOT by their own id. My linkages use a unique ID text attribute, which plays havoc with this function. However, this seems like a simple fix: simply remove the parseInt() function, and the actual linkages should work. 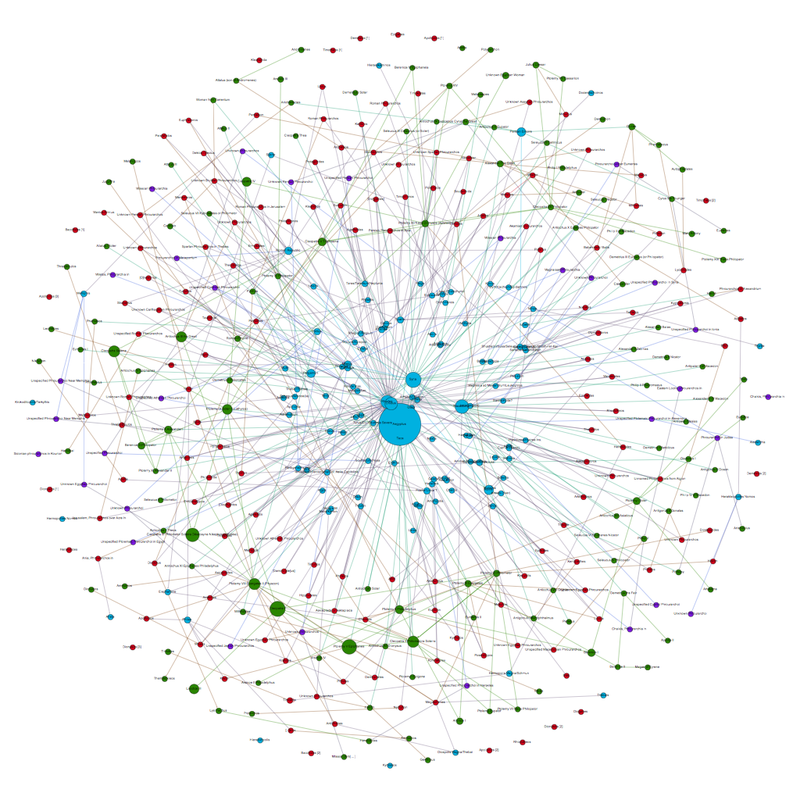 Getting closer: I see a network graph….only minus the network. Yikes. So, what is going wrong? The next task will be to finalize some functionality for the D3.js portion of the graph, then on to integrating the whole mess with leaflet. Then, when I have all of this in order, time to re-write it to accept all manner of different inputs / etc for BAM. More on both of these ideas later. 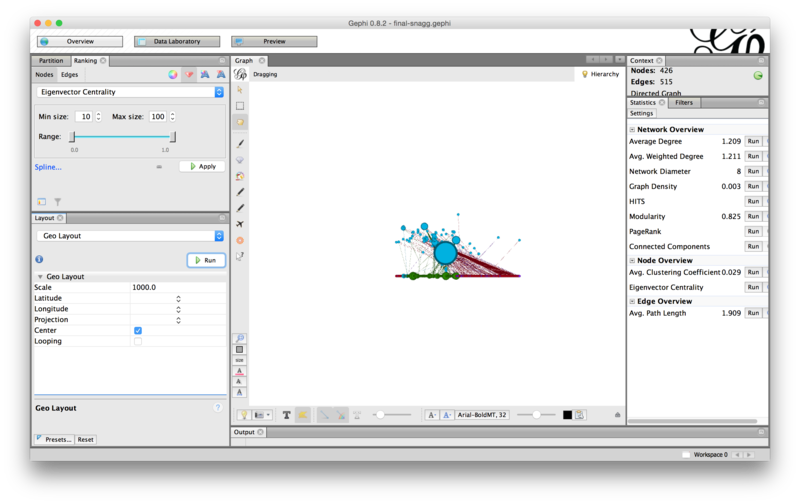 Before I begin, I once again want to recognize the excellent SigmaJS Exporter plugin for Gephi. This really does mitigate a lot of the grunt work involved in quickly making a usable, interactive social network graph. However, sometimes you just want another feature or some further refinement – in my case adding workable footnotes to information on each node. What I found is a bit of a hack, and certainly can be improved, but it works. First, you are going to want to have your document in a format that is readable by OpenOffice / LibreOffice / etc. What you need to do is select the bit of text you are interested in, dump it into a new file (making sure to include your footnotes!) and then export that file as XHTML. tag at the end of the line. Now, simply paste what is left into a field in your Gephi data. Export as usual, and viola! you have your clickable, interactive footnotes. Now, this is good for a quick and dirty solution, but it would require a modification of the json datafile if you ever make a change or wish to add more information (or, even worse, a re-export of your entire network). As such, this solution will not be used for BAM, as we are seeking a more flexible and modifiable code base. This post will outline some of my efforts to bring social networks into dialog with geography. Although I have found some interesting plugins and hacks, the results still leave something to be desired. To provide some background: From my dissertation I have a nice, interactive map of all garrisons (phrourai, in orange), and garrison commanders (phrourarchoi, in white) from all of Greek sources up to the mid second century C.E. 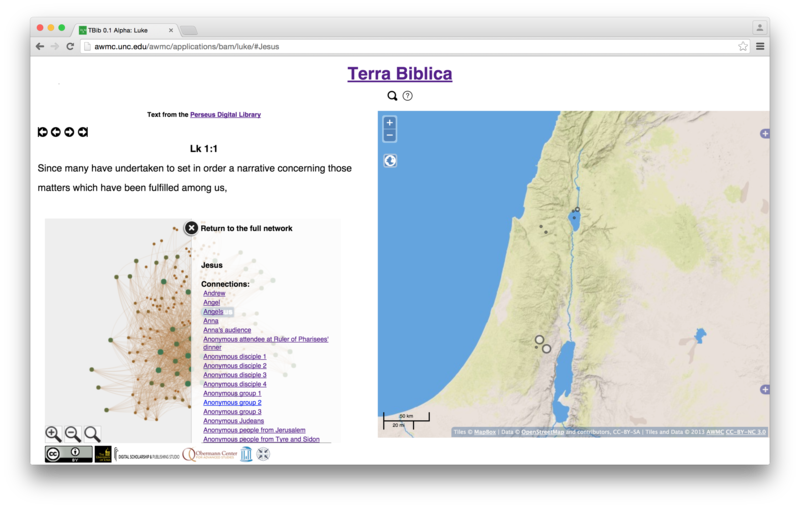 This is all nicely georeferenced, linked to other projects such as Pleiades and Pelagios, and serves its purpose pretty well. However, this provides the location and frequency of garrisons and commanders, and does not really show the social network that developed between commanders, monarchs, and communities. I could perhaps use a clustering strategy to create dynamic markers around specific points, but that seems to be a very unwieldy solution. Strictly speaking, by modeling people (phrourarchoi, monarchs) with places and abstract communities I am moving beyond a social network and instead looking at an information network, as I am interested in a number of different connections (social, geographic, ideological) that are not traditionally associated with social network analysis. The first step to get all of my data into Gephi, assign different “types” to my nodes (in my case people, offices, places, phrourarchoi). I then created a network map, ran statistics, assigned the node size based on degree, and ran a force atlas layout. At the same time I also color coded the network based on type. This is all pretty basic Gephi use so far, and produced a perfectly serviceable network graph. First graph. Pretty basic and serviceable. Betweenness Graph. Note the increased importance of individuals. However, this result is somewhat meaningless, as my graph covers a period from the 400s BCE to the 100s CE. Despite any of his wishes to the contrary, Ptolemy VIII did not live forever, yet he is the unquestioned central authority of this graph. All of the other Egyptian monarchs also score highly, underlining their importance in the communications and relationships between different phrourarchoi. This is an interesting yet hardly unsurprising finding – a good portion of the surviving data on phroruarchoi originates from Ptolemaic Egypt, which may inflate the relative importance of the dynasty in this kind of analysis. 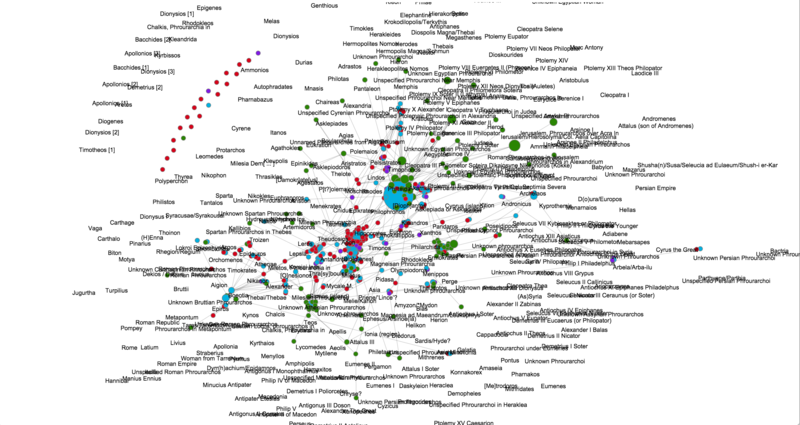 What this map does show is the enormous influence of individuals – most of whom were not phrourarchoi themselves. However, I am interested in garrisons as a sustained phenomena across several centuries, so I want to get back to the importance of location and geography on garrisons. In other words: Where are the most important locations for phrourarchoi, and how do those relate to one another? Running an Eigenvector Centrality measurement produces a graph that somewhat mimics my original map, with physical locations, not people as the most significant authorities. This gives a better impression of what I am looking for – the centrality of a node relative to the whole network, which in my case privileges locations, which often serve as a bridge between different populations of nodes. To me this is an interesting graph: It shows the importance of locations, while still highlighting important individuals. Now that I have this graph, I would love to place it on a map. I actually have coordinates for all of the locations, so a simple use of the Gephi GeoLayout plugin puts all of my identified places in a rough geographic layout. From here I simply fixed the location of the places, then ran some other layouts to try and make a coherent graph of people and offices that did not have a specific geographic value.The results were generally less than satisfying. The individuals in my dataset are not assigned coordinates because it would make little sense to do so – some phroruarchoi served in multiple locations, and almost all imperial phrourarchoi served outside their place of origin, were buried somewhere else, possibly lived in yet another location, etc. Adjusting the size of the nodes and running force atlas eventually produced a result that looks more comprehensible, if a bit small. Note how the nodes are now literally all over the map. So, what happened? If you do not have coordinates already explicitly assigned to your data, Export to SHP actually does not use “geographic” coordinates, and instead uses, in the words of the plugin, “fake geography – that is the current position of the nodes in the Gephi layout”. My thought that this position would line up with correct coordinates fromGeoLayout were false –Export to SHP treats the middle of the map as an origin point (instead of using whatever geographic data is present), and as such it does not match with any projection in QGIS. So, is there a way around this? 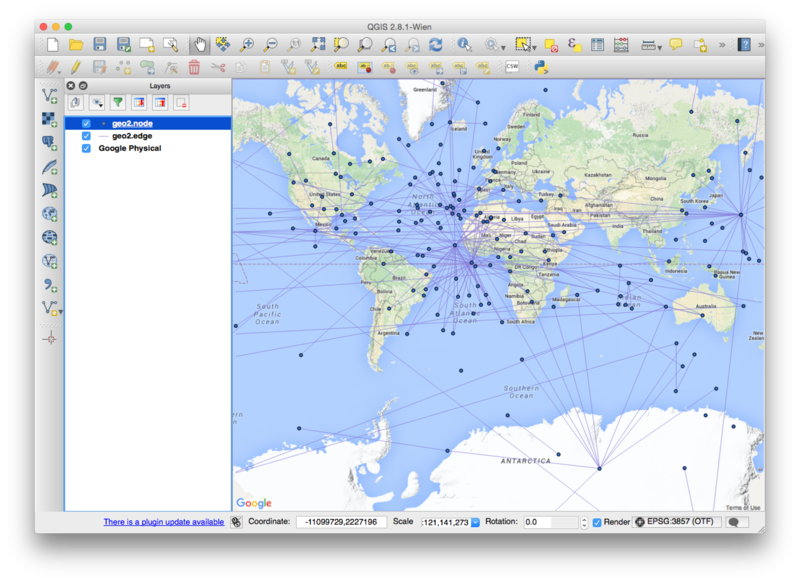 Short of writing a new plugin to do so, it looks like Gephi is simply missing the functionality of assigning geographic points to nodes that do not already have that information, then exporting that graph in a way that makes sense to mapping software. I could export an image and georeference that, but that will not provide the functionality I am looking for either. What I would like is for a graph produced by Gephi to use coordinates for nodes that have them, and make real world coordinates for nodes that do not. This map could then be placed on Leaflet / OpenLayers / whatever map, providing a level of interaction beyond a static image. As it is impracticable to duplicate the functionality (especially the statistical tools and layouts) of Gephi in a mapping application, this strikes me as something that would be very valuable to visualization and study. My next idea is to see if R has something close to what I want, which I will detail in a future post. 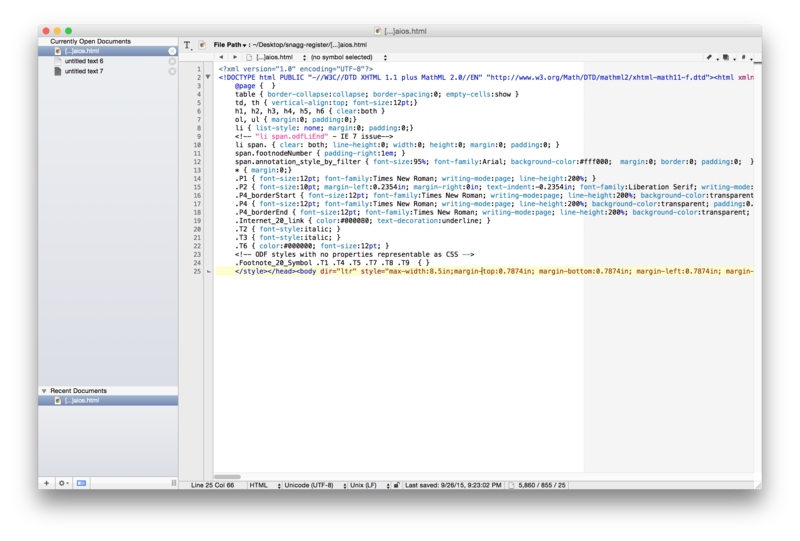 This is the first in a series of posts where I will be detailing some of the code and development of BAM. Some of these techniques may be old hat for some users or simple hacks, but they might be useful for anyone else who is trying to do similar work. 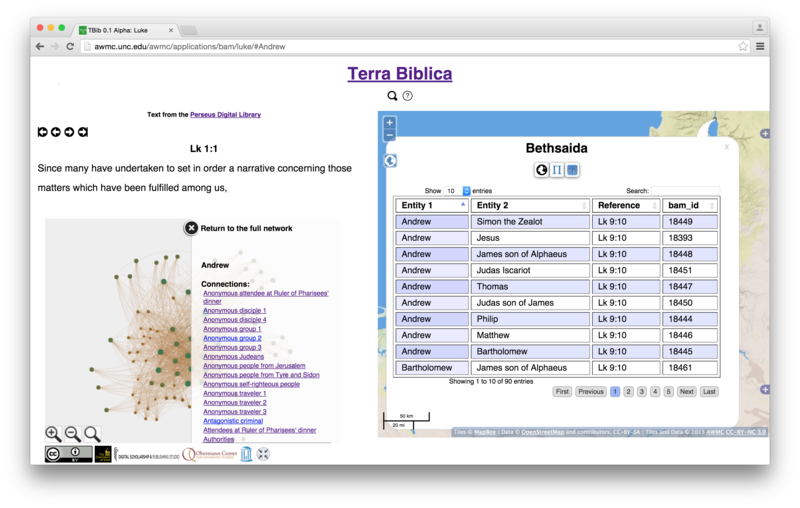 Terra Biblica with both the social network graph and map displaying information on Jesus. For a working demonstration of the final result, see http://awmc.unc.edu/awmc/applications/bam/luke/. All of the code mentioned in this post, and created for BAM, is available at: https://github.com/Big-Ancient-Mediterranean/BAM. Step 1: Get your data in order! Before attempting any of this, you need to ensure that the entities that you are using in Gephi and the ones you have in your database have a consistent, unique ID. So, if Andrew has an id of 1234567 in Gephi, you need to associate 1234567 with different locations, texts, etc in your database that are also related to Andrew. Failure to do so will make it VERY difficult, if not impossible, to get all of the different components to talk to each other. 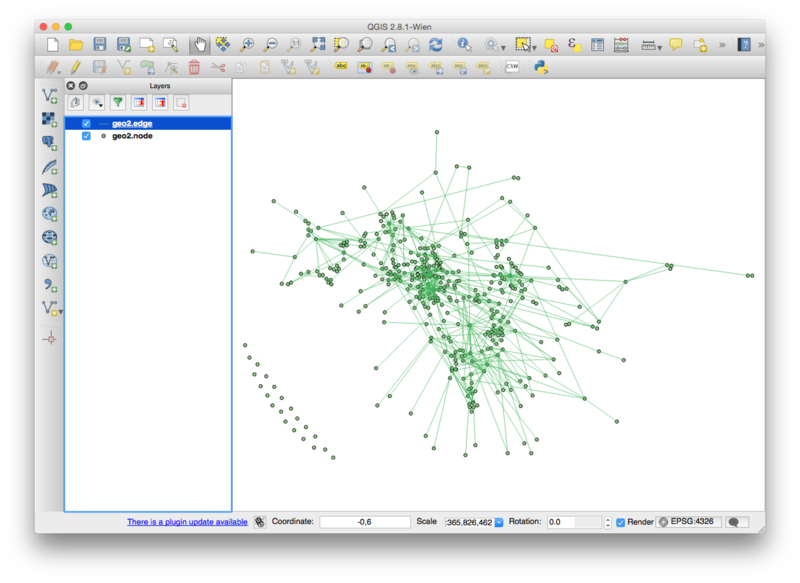 Next, you actually need to build your network in Gephi and export it out. Building the network itself is beyond the scope of this post, but you need to install and familiarize yourself with the excellent SigmaJs Exporter created by Scott Hale at the Oxford Internet Institute. Essentially what we are doing is taking the output of the SigmaJs Exporter, cutting it down, and making it communicate with a dynamic, interactive map on the same webpage. After exporting your network using the SigmaJs Exporter, you should have a directory structure that roughly looks like the screenshot to the right. You want to upload everything but htaccess_example, web.config, and index.html to your webserver. We then need to add this network to an HTML file that already has a map. In our case, we are modifying the code behind Strabo Online and SNAGG. I may detail how to create a map in another post, but there are plenty of resources online to get you going on a basic map. Now we need to place some divs to hold the content from our social network. These can be styled at your leisure. tBibPersonConnections is where the work really happens. Lets examine this function slowly. The function takes the ID of the person selected and layer that houses all of the feature information as arguments. first clear the map layer of all features, and then sets up an array to hold all of the new features that we will be adding to the map. We are interested in every occurrence of an individual, so we do not care if the person is the target or the source. Our tbib_network table is exactly the same as the table used to build our Gephi network, and all people are assigned a unique ID that remains consistent across tables. In the future, this database work will be mirrored by static json files, to allow for the easy export / import of BAM material. The result is a layer that changes depending on what person is clicked. That is great for changing the map, but what about changing the nodes on the network graph for when an individual is selected on the map? As we are displaying people names, not ID as clickable information in our popups, we need a way to translate the names to the IDs used by SigmaJs. This is simply a trivial php script that looks up an ID from a name table. Once the ID is returned, we simply activate the node with a call to the nodeActive function that we extended earlier and to our tBibPersonConnections function. That is all there is to it – just a few listeners and a variable or two. There may be more efficient ways of doing this, but all the components are talking to each other!